The first floorof themill was used to takegrain forgrinding and to give back flour. The cap type mills had two doors in different sides of the mill, in case the turning wingscovered one door, it would bepossibleto carryin grain through theotherone (1 picture). 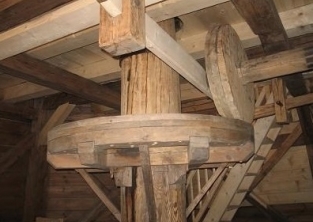 In the centre of the mill there were installed a riser's support with an adjusting bearing, movable supports of the spindles which were turning millstones, tooth-wheels to turn the millstones' spindles (2 picture), pulleys to attach various mechanisms. In larger mills there was a special sifting device to sift flour sa that pies were white (3 picture). The sifting device ismade of asifting box in which a frame shaft (4 picture) is turned with the help of a rope gear. In windmills turning from wingsto the millstonescomesthrough the main gear.lt is made of a horizontai wing roller, or shaft, a wing tooth-wheel, a horizontaL tooth-wheel and a system of tooth-wheelsand small rollers. 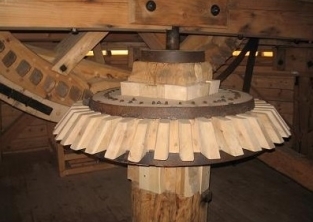 There are two types of mills according to gears: one-stage and two-stage gears. 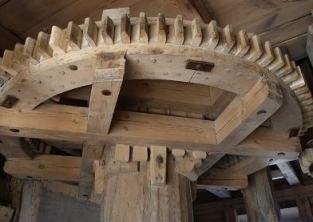 The turning of one-stage gear is given to the millstones from the wing roller by one pair of tooth-wheels.The horizontai tooth-wheel is attached to the spindle axle and turns the upper millstone from above. Mostly it was used in smaIIer pole mills having only one pair of millstones. 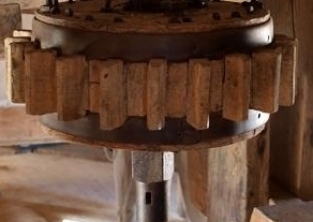 The turning of two-stage gear is given to the millstones by more than one pair of tooth-wheels. Using the wing tooth-wheel, the wings turn the angular tooth-wheel which is put on the top of the vertical axle. On the bottom of the axle, there is a tooth¬wheel of a bigger diameter (5 picture) which turns the smaIIer tooth-wheel of the axle of the spindle, and the spindle turns the upper millstonefrom thebottom. In two-stage windmills there used to work one,two or even three pairs of mill stones. Žaliūkiai windmiII has a two-stage gear. Here two pairsof mill stones are installed to grind fine or graham flour. At the lower end of the vertical shaft there is a metai pole that is inserted inte the greased ball bearing. Bearing is also mounted in ametai box and secured with screwsfrom the sides. By rotating the screws, bearing can be moved from side to side, this is used to adjust vertical position of the vertical shaft, matching of gear of upper millstoneshaft and starwheel teeth. As old millers say,gears should be matched "in the barley grain'', for no barley grain could fit between the teeth when the mill is running. Metai mill shaft's bottom end is also inserted into greased ball bearing, built on the chassis of wooden beam. Shaft bearing is adjustable with screws to determine the vertical position of the shaft andgearmatch. 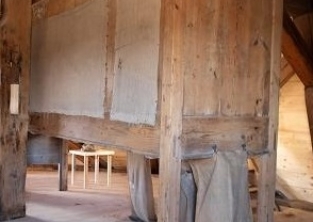 The second floor of the windmill is also called a millstone floor. There are installed millstones,mechanisms to pour grain inte the millstones and to take off the upper millstone. Millstonesare one of the oldest grinding tools in the mills. 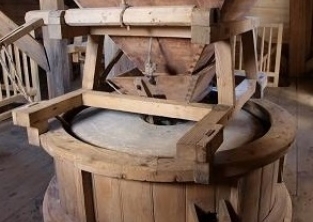 The first millstones used to be a flat stone on which grain was mashed using the other stone. It was a mashing millstone. Later a mashing millstone had a tub shaped dent for the grain not to spread out. ln the 10th century turning millstones were begun to be used. They had two flat stones put one on the other. The lower millstone is not movable, and the upper one is turned by a metal spindle which is put through the hole made in the centre of the lower millstone. In the upper millstone there is a bigger hole, through which grain is poured. The upper stone is held and made to turn by ametal raiI. lt is installed across the bigger hole and is supported by a spindle. The millstones are covered by a vat. The fit of the millstones is regulated in various ways (with wedges, springs, screws) lifting or putting down the end of the spindle support. On the vat of the millstones there is a special mechanism for pouring grain in. It is made of a support, upper and lower funnels and a shaker (6 picture). The upper funnel is bigger, bottomless, its opening is covered with a smaIIer funnel which has a bottom. In the side of this funnel there is a small opening through which grain may pour out. In order grain was poured smoothly, the upper funnel is shaken.Most often a funnel is shaken inte a bigger hole putting in a small beam of hard timber. When the millstones turn, the spring presses the small beam and it moves around shaking grain from the funnel in to the bigger hole. From the vat of the millstones, the flour is poured to the first floor through a special sleeve to which sacks are fixed. Millstones were made of stone or moulded. Also there were used stone-moulded millstones. Millstones were taken off in the cases of sharpening (carving grooves) or moulding up (making thicker) (7 picture). lt was done by a miller himself or hired masters. AII needed materials were bought in Šauliai. On the third floor of the cap mills there was a mechanism to lift grain sacks ascale and holes in the floor above the millstonesto pour grain in (8 picture). 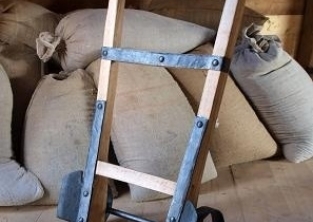 In old mills there were no mechanisms to lift sacks,so they were carried up by stairs. Later various gears were used to lift sacks.ln cap millsthere appeared a frontal friction gear. On the riser there is attached a horizontai pulley,sheer to it, using aprincipleof alever, there is installed a roller of a lifting mechanism and a pulley. The edge of one pulley tightly touches the edge of the other pulley making the angle of nearly 90°. 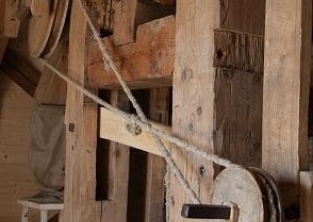 The mechanism lifts a sack by winding a rope or a chain around the roller of the mechanism, pulling up the rope and pressing pulleys with the levers. 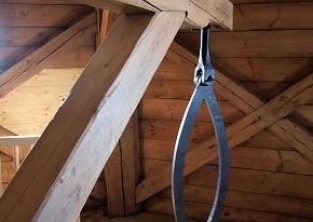 ln Žaliūkiai windmill sacks were lifted by releasing the rope and joining the pulleys (9 picture). On the third floor the farmers were queuing to grind their grain. Mills began to use scales in the 20's of the 20th century. Before that, the charge for grinding depended on the number of grain sacks. Also it was possible to pay by food products and linen for wings. During the war there was a special fee – 5 kg from 50 kg of grain. The fourth floor is the cap of the mill, put freely on the frame that could be turned. The cap is fixed to the frame with woodblocks which are attached to the top of the frame. 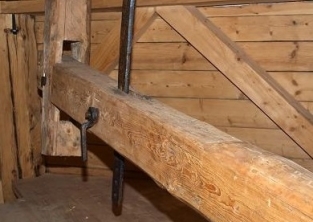 In the cap, there is installed awing (horizontai) rollerwith awing tooth-wheel,an angulartooth-wheel put on the upper end of the riser.lf thecap of the mill is turned with the help of a pole (as in Žaliūkiai windmill), pole beams are also installed in the cap. Wing roller is made of a thick oak loq. One end is attached to the supporting bearing in the cap of the mill, the other is put out through the side of the cap. 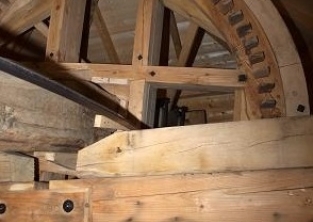 Mill wings are attached to that end into the cross (head) of the wing roller. The cross of the wing roller is made of the thicker end of the wing roller. In the roller there made two perpendicular holes passing each other. The head of the roller is bound for not to crack. At the end of the 19th century it was begun to manufacture crosses of the wing roller from east iron. The thick end leans on the stone bearing. The part which is in the stone is called theneck of the wing roller. On the middle rectangular part of the roller there is attached a wing tooth-wheel (10 picture) to turn a bevel tooth-wheel which is att ach ed to the riser (11 picture). The outer cirele of the wing tooth-wheel is even. It is winded up with a belt brake to stop the mill. One end of the brake is attached to the frame of the mill, the other end – to the brake lever, called "a press'' (12 picture). One end of the press is attached to the beam of the basisof the mill cap with help of ajoint. By lifting or letting down the end of the brake lever, the wing tooth-wheel is released nor tightened. The end of the lever is heavy, so it is lifted with the help of another lever. lts end – the shorter part is attached to the press, the base usually is any stronger construction of the cap. The other end of the lever-the longer part is put out some 2–3 metres and a brake rope is let down from its very end.